After a couple of days of prep on the boards and final fitting, I was able to complete the base. I started by selecting the boards I would use for the moulding. My original intent was to wrap the moulding all the way around the case, however after pondering this for a while I made a change to the design. I decided to stop the base moulding flush with the back panel. Sometimes you just have to design on the fly. I decided to take both the base and crown cove moulding out of the same board. This would allow for as little waste as possible, and save some efforts. After surfacing all the faces to the same thickness with my jack plane, I showed one of the boards t o the front of the case. 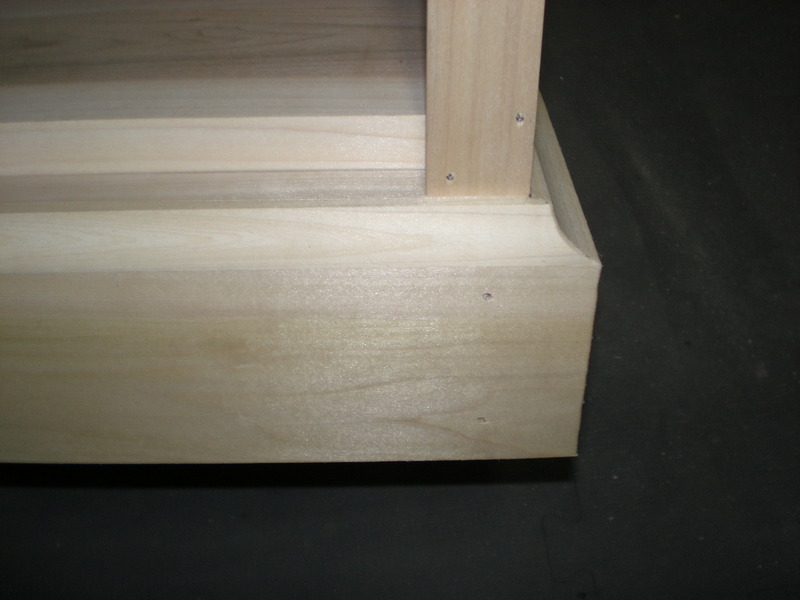 I wanted to set the height or width of the moulding off the front because this is what matters in the design. 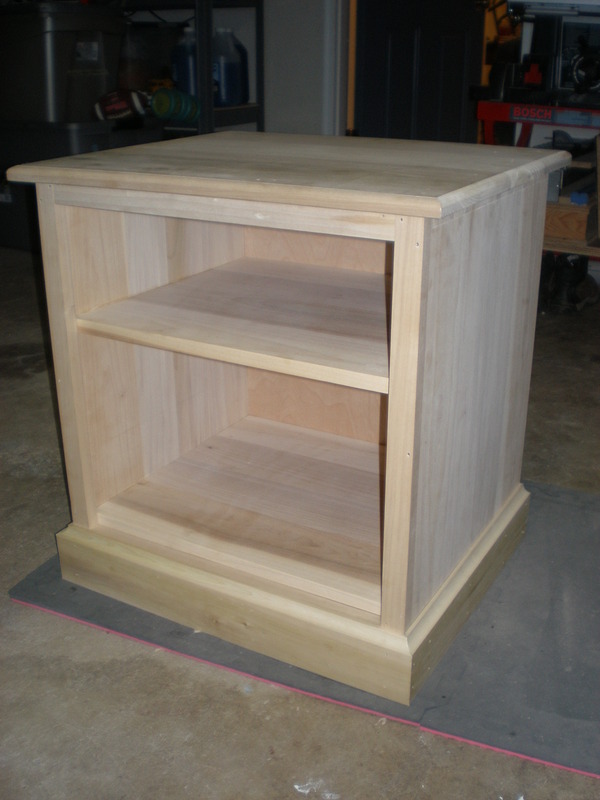 The front piece should line up with the bottom shelf and the bottom of the face frame. I wasn’t too concerned where it landed on the side of the carcase…just made sure it was straight/level. After marking out the proper width/height, I ripped the boards with my x-cut panel saw…yeah, still no rip saw in my arsenal. I cleaned them up and snuck up on the perfect fit trimming the edge with my jack. I set the remaining waste to the side for use later as the crown moulding. I set up my router in the router table with a cove bit for the profile. I sent all boards through the bit, and then moved onto cutting mitres. 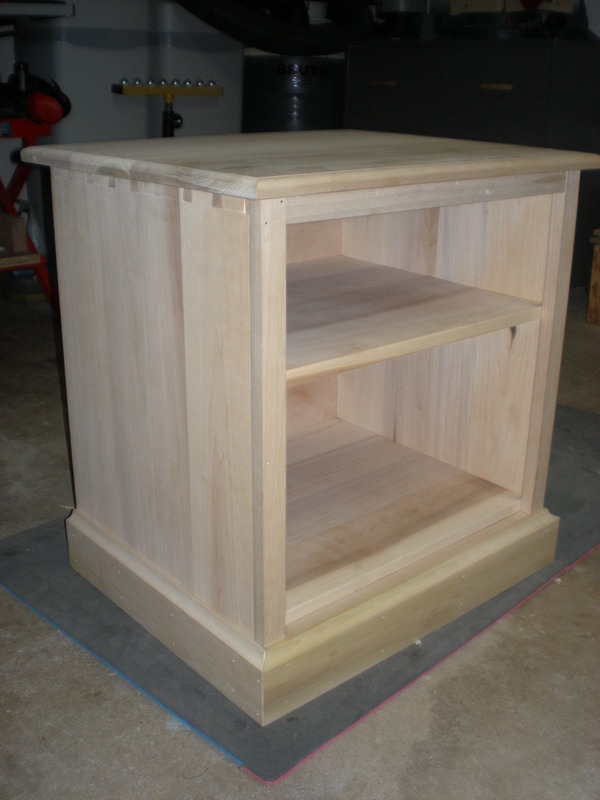 I mitered the corners and attached the moulding with 4d finish nails. This entry was posted in furniture, hand tools, nightstand, VCF, woodworking and tagged furniture, hand tools, woodworking by villagecustomfurniture. Bookmark the permalink.